Every set of dances consisted of two dances and took up from half an hour to an hour or even longer. A man could ask a woman twice, which means that they would dance two sets and spend an hour or even two together during one evening. Asking a woman twice always meant a special attention, however, the meaning of the attention would depend on the kind of the ball. If there were many ladies of a man’s acquaintance he could ask one lady twice only if she was his fiancée, or he meant to propose to her soon. If he knew only a few ladies it would mean that he preferred the one above the others, and if he knew only one or two ladies present it’d mean nothing. The idea was to socialize and provide entertainment to everyone, so a couple who spent a lot of time together was rude towards others. A lady who didn’t have a partner for a dance would sit down on a bench and wait for someone to ask her for a next one. A lady could refuse dancing with a gentleman by saying that she didn’t wish to dance, but that meant that she wouldn’t be able to dance with any other man for the rest of the evening, or at least for some time. Accepting a man for the same dance that a woman had already refused to dance with some other gentleman was particularly rude. The ability of talking while dancing was a sign of elegance. Some of the dances required standing aside for a while, while waiting for others to finish their figures. Especially if there were many couples dancing, not all of them could dance at once. The waiting couple was obliged to talk in the meantime. A not dancing gentleman could wander around and watch the dancing couples, but he should not approach a man standing with a partner during a dance. The manner in which Sir William Lucas approached Darcy during Darcy’s dance with Elizabeth at Netherfield was rude. And Darcy was right when he scolded Bingley for abandoning Jane during his dance with her at the Meryton assembly and coming to nag Darcy to dance with Elizabeth. 1.) A public assembly, like the Meryton one where E&D met, was a public dance held in a town’s public assembly rooms (something like a dancing club today where everyone can come). The assembly rooms would usually consist in the ballroom, the supper room, the card room and sometimes even the billiards room and extra facilities for private parties. Everyone who could afford an adequate dress and the entrance fee could attend the ball (a father could also purchase a subscription for his daughter for all of the balls held in particular assembly rooms during a season – the cost might stretch from 1 pound to around 10 guineas). That means that there would be people there from various social spheres, and although they were all allowed to dance, they weren’t all allowed to dance with just anyone they wished. The majority of the present would include the lesser gentry, the professionals and gently trades. Which means that i.e. a clerk wouldn’t be allowed to dance with a Miss Bingley or Miss Darcy, and likely not everyone would be allowed to dance with a Miss Bennet either. There was a Master of Ceremony who would decide about it. A man who wanted to dance with a lady he wasn’t acquainted to had to seek introductions via the Master of Ceremony or a mutual acquaintance. Only after they were properly introduced he was allowed to ask her to dance. A man was obliged to dance with the ladies of his own acquaintance but not beyond. And at very public assemblies, i.e. held in large towns, it was even permissible to dance with a lady of one’s acquaintance more than twice, because otherwise she would remain without partners since she would hardly know anyone present. If a lady of one’s acquaintance remained without a partner a gentleman was obliged to ask her to dance. We know from P&P that both Bingley’s sisters were dancing when Bingley nagged Darcy, so Darcy wasn’t rude by not dancing then. The Master of Ceremony would usually give numbers to the ladies on their entrance. The number would indicate their place in the dance. The most prominent ladies or new brides would often call the first dance. Later, he would call the number of the lady who would lead the next dance and so on. The cards and billiards rooms were for gentlemen who chose not to dance. It was possible for a lady to join her husband in the cards room, but most likely she’d remain in the ballroom, watching her daughters. Tea (not supper) was served in the middle of a ball. Usually all drinks and such had to be purchased, like at a bar today. Gender dancing – two ladies or two gentlemen – was allowed at some assembly rooms only with the Master’s of Ceremony permission. A gentleman was supposed to call on all of the ladies he danced with shortly after a ball. 2.) A private ball differed in some points. Only invited people were present, so there wasn’t a risk for a lady to dance with a butcher. Then everyone could dance with anyone. If Lizzy were without a partner during the ball at Netherfield Darcy would be obliged to dance with her even if he didn’t know her. Of course there was no such a need then, because there were many officers and ladies had enough partners to remain occupied. Darcy danced with Lizzy because he wanted to. A hostess was not supposed to dance at her own ball. She should though find partners for any lady who was her guest. Similarly, her daughters were not supposed to dance unless there were enough partners for everyone else. 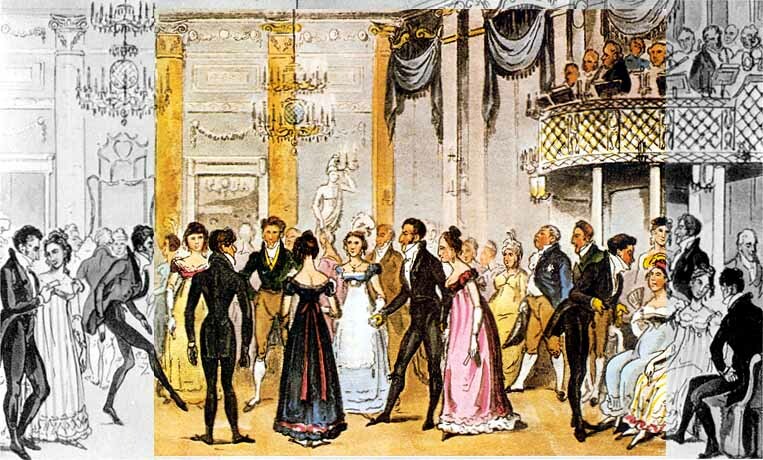 Men of the family hosting a ball should dance when partners were scarce, however, they should also spend as much time as possible entertaining their not dancing guests. Neither Caroline nor Louisa were asked by Darcy at the Netherfield ball, but Bingley, not very concerned with propriety, again asked Jane twice, and snubbed other ladies who were his guests. Supper (not tea) was served at midnight – usually the white soup Bingley wanted Nicholls to cook. An acquaintance made during a private ball wasn’t necessarily an acquaintance yet. One had to be reintroduced at another occasion or behave as if he never met the lady he danced with, since it was done only out of lack of partners. One shouldn’t dance more than two dances with one person there, since they could dance with anyone present. A man, especially young, should not accept an invitation to a private ball if he didn’t mean to dance. If he was lucky he wouldn’t have to, because there would be enough partners for the ladies present, but in case there were not, he should dance. Mr. Knightley broke his ‘not dancing’ rule because Harriet had no one to dance with. That referred to single ladies, or very young brides. Older ladies danced rarely. Balls were for those who were looking for a husband, not those who already had one. Compare it to today’s occasions. When you go to a night club with a group of your friends you mostly dance with them only, unless a man sees a girl he likes and wants to ask her. No one at a discothèque will be offended that you’re having your beer at a bar while they have no dancing partner. The same was true for the Meryton Assembley. Darcy danced with Bingley’s sisters, who were a part of his company, but he didn’t have to dance with anyone else. Yet, if you go to a friend’s party, and you see a girl sitting in a corner while everyone else has fun, you feel obliged to talk to her (dancing isn’t a must today). Even if you’re not going to see her ever again, you all are there in a friendly company so it’s only fair to socialize and help others join the party. That’s a private ball, like the Netherfield one. 3.) An impromptu dance in someone’s house was a spontaneous occasion for some fun, like at the Lucas Lodge. We can also easily imagine such a dance at Mansfield Park at any time. No one was required to dance there, and no strict rules were observed. Scottish reels are better adapted to the social private circle than to the public ball. Reels demand a frankness of deportment, an undisguised jocularity which few large parties will properly admit. An interesting insight into Darcy’s character, isn’t it? P.S. Hele reminded me that the Regency dances weren’t slow and stately, but very lively. 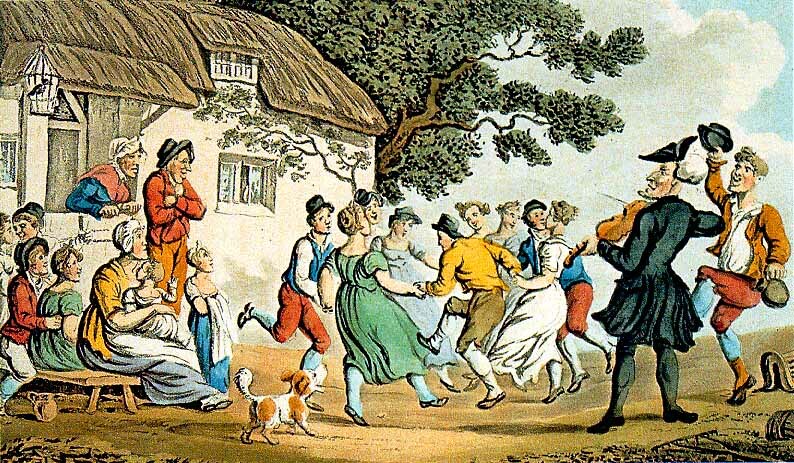 Country Dances, as their name explains, came from the country. One more rule: brothers and sisters weren’t allowed to dance together. Thank you for an interesting essay. You said, that brothers and sisters weren’t allowed to dance together. How about married couple with each other and alternatively with other partners? Were there any restrictions or obligations (eg always the first set with one’s husband, no more than one set with each partner, etc.)? And how about father and daughter? And if that was allowed, would it be accepted for Darcy to dance with his sister, his being her guardian? Oh, I have found an answer to part of my question in “(Not)Dancing With One’s Wife” (posted September 28, 2008). So married women hardly ever could dance, it seems. How about any father with his daughter and Mr Darcy together with Miss Darcy? Yes, married couples couldn’t dance together at all. They could dance with others though, so Darcy could dance with Jane, and Bingley with Elizabeth. They wouldn’t dance more than once with any other person unless circumstances required it e.g. a lady would remain without a partner. Otherwise they wouldn’t want to suggest that they liked any lady in particular. Sisters and brothers were not allowed to dance with each other, so Darcy could never dance with Georgiana, unless at home for fun. William Price cannot dance with Fanny for example. Fathers didn’t dance at all. They occupied the card room or walked around like Sir William Lucas did. Dancing was for young people, and since the dances required a lot of physical strength it could be even too much for them. Imagine a 50 year old man hopping around! A lately married woman would be asked by many gentlemen in order to be welcomed to the neighbourhood. The first ball would be given in her honour. The older she’d become the less she’d dance. Her husband would dance with other ladies from the neighbourhood. The unmarried ladies would be asked before the married ones. If a husband had enough dancing after a couple of sets he was supposed to excuse himself to the card room. Remaining in the ballroom would suggest that he’s still an available partner, and so he’d slight any unoccupied lady by not asking her to dance. Generally, since dancing was one of the few opportunities to meet eligible bachelors a lady would prefer to be asked by an unmarried man. Darcy’s refusal to dance at the Meryton assembly means that he’s not willing to look for a wife in the neighbourhood. The situation looked a bit differently at a public assembly. There a man was supposed to dance with any lady he was acquainted with if she didn’t have a partner. The company varied a lot and she wouldn’t be willing to dance with just anyone e.g. a lowly born local. A friend’s dancing with her spared her an unpleasant partner. Darcy danced with Bingley’s sisters out of duty, but it was all he was required to do. Bingley danced with everyone because he was open to meeting a lady and falling in love. Balls were organized so that people could socialize and have mutual fun. That’s why remaining in one’s home company was seen as offending to others. Darcy shouldn’t even stop to converse with his wife or sister during a ball. They can do that at home. A married lady would take care of an unmarried one. So Elizabeth would look after Georgiana during a ball, and if Darcy wasn’t married yet when Georgiana went out he’d ask another woman to do that: his aunt, married cousin or sister-in-law. I have learned much from your clear and concise answers. Can you tell us sources for your information so that we might read more on our own? Lynn, I’m glad you found my post helpful. I don’t remember exact titles today, but I used mostly old dancing manuals. I took care to choose those that were very close to Austen’s period and referred to England rather than the US. Sometimes I read some of Austen’s adversaries who also had their opinions on dancing and theirs were the strictest. Austen and her characters did break many rules. It’s important to know about it, because it informs the story. I also closely searched through all of Austen’s (and not only) novels for references. Very often one book gives some insights to another. However, all my research in this domain was done for my own purposes, that is to write stories set in the Regency era. So I didn’t bother to properly reference them as would be done in case of an academic paper. Thanks for taking the time to reply. I’ll keep reading and researching and hoping to learn as much as you have gathered! Thank you for such a precise infromation! Then there is another set of questions about walz. I think I read somewhere, that when walz was first introduced only married women were supposed to dance it and that at Almacks the patronesses gave the permit for the ladies. Did you come up with guidelines for married/unmarried ladies about how to walz and with whom? And the last set of questions about the “rank” of dances. The opening set, the supper set and the last set were the most important ones, I presume. Was it so? If a man was supposed to ask his favorite only two times during one evening, which of the tree would he choose?